I have a painting in Pareidolia curated by Casey Weldon at Antler + Talon Galleries in Portland, OR which opens on March 28, 2019. Pareidolia (from Merriam-Webster), per-ˌī-ˈdō-lē-ə: the tendency to perceive a specific, often meaningful image in a random or ambiguous visual pattern. I just completed a new painting titled Say What You Mean, which is a personal painting describing my issue with just being up front and open with people throughout my life. I have always been better with images than words and so here I take a step to recognize the issue and move forward knowing that it’s ok to say whatever I feel. Description: As an artist, say it as you do. With paint, write it down, let it fly off the cuff because it was your first thought and you probably meant it. Really mean it too because you are only here for a short while. You can find prints up at the shop. Opening next Saturday, September 8th, I will have a new painting titled Feels Good in the 13th Annual Blab! 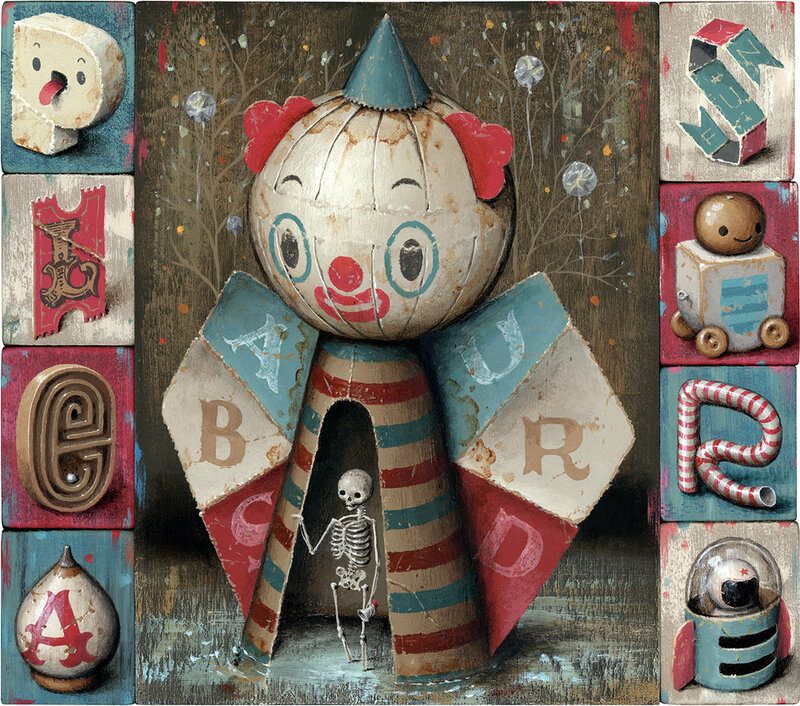 Group Show curated by Monte Beauchamp at Copro Gallery in Santa Monica, CA. You can find prints of this painting in my shop. I have also added two smaller prints (Ok and Life Cycle). My paintings have been coming around a bit slower since I've been doing these multi-panel pieces, but I have completed this painting titled "Stay Woke". I realize those two words have a lot of meaning in U.S. politics, which I do my best to avoid since it seems to just bring on insults and arguments. I'm just hoping we can find a middle ground so that our issues can be solved in a sensible way. I also know that the term "Stay Woke" has been used in the past to encourage equal rights for all. Either way, the words have been lingering in my head and so I put them down in this painting. You can find the original and prints here. This one is a simple thought about that child that lingers inside of some of us (most of us here, I'd imagine). It is something I think about quite often. I do whatever possible to cling on to that inner child since it is an brave explorer and is also where most of my ideas come from. To me, it makes life worth so much more. You sometimes see people grow up and the older they get the further that fun, little being gets stuffed away. The initial vision was a fun looking place that never gets visited and slowly erodes, yet it does it's best to remain happy and awaits the return of that kid. My images almost always seem to portray doom and gloom! I've been shoveling through my brain, tossing out some darkness and trying my hardest to stick to absorbing positive thoughts. In the process I was thinking about my fifteen year old daughter poking fun of my typical dad concerns, complaints and worries. Sometimes my only response to her is "You Will See". It's sometimes tough to keep fighting off problems and remain strong inside. Of course, we've all been through trouble. We deal with it and keep moving ahead. She's had a different life than I have and I do my best to see her happy, but just a suggestion to keep in mind: It is not that easy to keep going. Hold on to hope through it all as you go forth. Those are the words in this piece.